The RX created the luxury crossover segment 20 years ago and has remained one of the brand’s best-selling global models. The new RX L retains the stylish lines of the current RX, but benefits from increased length and highly adept interior packaging to provide accommodation for up to seven passengers. The RX L gives Lexus customers the option of an additional row of two seats, without compromising the sleek styling and easy manoeuvrability that are valued qualities of the standard-form RX. 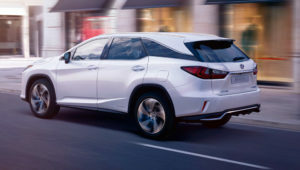 Lexus has extended the RX’s body length by 110mm at the rear and used a steeper tailgate window angle to secure comfortable leg and headroom for third-row passengers. The seven-seat version has a 40:20:40 split bench-type seat in the second row. Access to the third row is made easy, with just the pull of a lever required to slide the second-row seats forwards. The RX L also has a longer load space floor behind its third-row seats than its competitors, offering more versatile storage. The two third row seats have been designed to offer the same comfort and luxury as those in the second row. The second-row bench is set slightly higher than the third row, creating more foot room for rear passengers. The seats are finished with leather upholstery and occupants benefit from separate air conditioning controls and vents. For extra convenience, the rear-most seats can have a power folding function and smart power tailgate is also available (simply placing a hand near the Lexus emblem opens the tailgate). The load floor behind the folded third-row has a flat surface for easy loading. Other convenience details include a pair of third‑row cup holders, an easily stowable tonneau cover and covered slide rails. The Lexus RX L benefits from the same award-winning safety, style, luxury, and performance as its counterpart five-seat RX models. The trend-setting combination of SUV versatility and luxury saloon-like comfort comes packaged in the brand’s dramatic styling mix of sharp creases and curves. The Lexus signature spindle grille has an elegant chrome-plated surround, flanked (on higher grade versions) by triple L-shaped LED headlights. The blacked‑out rear pillars create a floating-roof effect, while the rear-end design picks up the spindle theme, with L‑shaped LED taillights enveloping the tailgate and wrapping into the rear wings. All RX paint colours have a scratch-resistant, self-restoring finish, using high-performance macromolecular polymer. 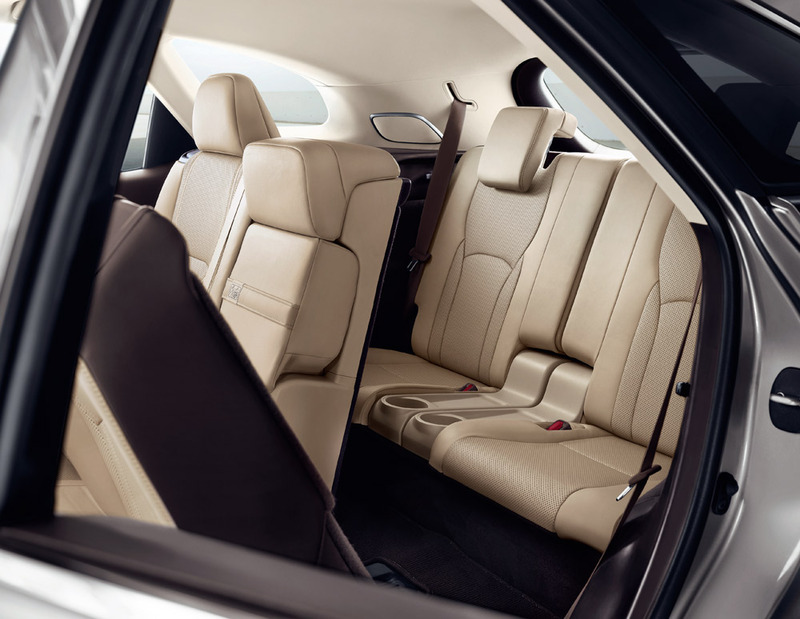 In the RX L, the full-length side curtain airbags cover all three rows. The Lexus Safety System+ (which will be standard for most markets) includes a Pre-Collision System with Pedestrian Detection, Lane Keeping Assist, Automatic High Beam and All-Speed Dynamic Radar Cruise Control. Other features available (according to model grade) include a Blind Spot Monitor, Panoramic View Monitor, Intelligent Parking Sensors, Rear Cross Traffic Braking and an Adaptive High-beam System. The RX L has a top five-star Euro NCAP rating. The self-charging Lexus Hybrid Drive system in the RX 450hL pairs a D4-S injection 3.5-litre V6 petrol engine with two high-torque electric drive motor-generators, producing a full system output of 308bhp/230kW for strong acceleration and overtaking performance. The E-Four all-wheel drive system is unique to the hybrid model. Instead of transfer gears and a driveshaft to the rear wheels, it uses an independent rear-mounted electric motor to drive the rear wheels when driving conditions demand.